Another Friday evening, another concert at St David’s Hall. This time it was the Orchestra of Welsh National Opera, performing a very mixed programme of pieces (by Rachmaninov, Ravel, Webern and Stravinsky). We’ve been hosting a former PDRA of mine, Chiaki Hikage (now at Princeton) and his wife Mihoko for a week so I invited them along. Chiaki gave a seminar on Friday afternoon at which he endured the usual bombardment of questions from Leonid Grishchuk, so I thought he would need some relaxation afterwards. I even managed to get front-row seats. It turned out to be a wonderful evening of twentieth century classical music, full of excitement colour and dramatic contrasts. First up was The Isle of the Dead, Op. 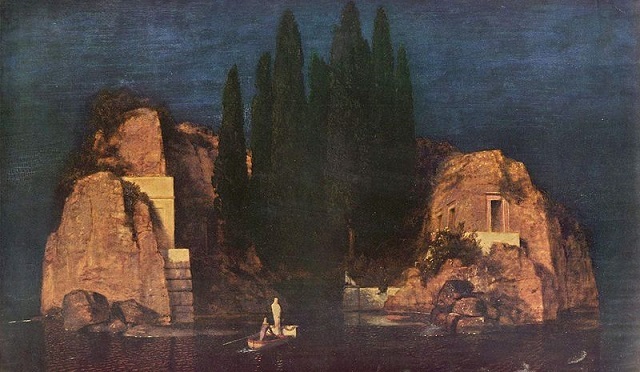 29 by Sergei Rachmaninov, inspired by a painting of the same name by Arnold Böcklin and written around 1909. The rhythms of the opening passage evoke the motion of a boat moving across the sea to the island, from which point the piece develops among a cloud of increasingly dense harmonic layers into a dark atmosphere full of foreboding. It’s a piece that many probably find a bit melodramatic, but I found it both accessible and fascinating. In fact it struck me that it wouldn’t be out of place as the soundtrack for a horror movie! After that we had a short break while the stage crew wheeled in the old Steinway for the second piece, the Piano Concerto in G by Maurice Ravel. This is a relatively late piece by Ravel, written around 1930. Its three movements form a sort of sandwich, with the first and third up tempo, jazzy in style and very Gershwinesque. The second, adagio, movement is very different: longer lyrical and tender, although I still detected a jazz influence in the walking bass of the left hand figures during the nocturne passages. The piece was played in sparkling fashion by Jean-Philippe Collard. We were so close that we could hear him humming along as he played. Apparently that bothers some people, but not me. I suppose that’s because so many jazz pianists behave a similar way, as did Glenn Gould. Anyway, after a glass of wine at the interval it was time for something completely different, the Six Pieces for Orchestra, Op. 6, by Anton Webern. This is a suite of short, intense, atonal pieces, sort of orchestral aphorisms, that embrace a huge range of musical ideas. Although sometimes a bit cryptic, I found these pieces in their own way at least as evocative as the Rachmaninov we heard earlier. The disorientating atonality of the compositions gives them an edgy restlessness, which I found very absorbing. If they were to be used in a film soundtrack it would definitely have to be a psychological thriller or film noir. The last work was probably the most familiar, The Firebird Suite (No. 2, 1919 version) by Igor Stravinsky from the ballet of the same name. This consists of five pieces, again of varied tempo and colour, ending in an exhilirating finale. Overall it was a hugely enjoyable evening, with all parts of the orchestra tested to the limits and emerging with flying colours. I’d like to put in a special word for the percussionists, though. Perhaps because my Dad used to play the drums I always feel they don’t get the credit they deserve standing there at the back. In particular, during the Webern and Stravinsky works, the percussionists – especially the tympanist – had an awful lot to do, and did it absolutely superbly. However, all parts of the orchestra played their parts equally well under the baton of Lothar Koenigs. This orchestra has had a few problems recently so it was a relief to find them on such good form. The St David’s Hall was only about two-thirds full, but the audience was thoroughly appreciative – especially for the outstanding performance of the Ravel Piano Concerto. I’m going to get hold of a recording of it by Jean-Philippe Collard as soon as I can! P.S. Our front row tickets only cost £22 each. Amazing.